Flooring is an unavoidable requirement in any home. While the past allotted only a few choices for those looking for other options than carpet, there are now several choices for those wishing to have a new floor installed in their home. With all of the options available, It can be a little nerve-racking trying to figure out what the best choice for your property is. Aesthetics are obviously important, but what about the durability, ease or cost of installation, and general upkeep? Different floor types vary across all of these variants. That being said, choosing the right flooring will involve selecting a type that meets all of these requirements at a satisfactory level. Read on to find out more about all of the different floor types available, their ideal uses, how to install them, and how to keep them clean. Hardwood floors are a time-tested flooring option, and remain one of the most popular choices for those wanting a versatile look that also contains a bit of elegance. Hardwood floors are available in numerous colors and finishes, and provide a neutral surface that won’t interfere with your décor. When quality finishing is implemented, hardwood floors can last lifetimes. In fact, it’s fairly common for many historic structures to have the same hardwood floors that were installed when the building was constructed. This is also a testament to the fact that these floors never go out of style. Many synthetic flooring options are actually made to look like wood flooring. Some of the more traditional materials used for hardwood flooring include white oak, red oak, maple, and cherry wood. However, Ipe, African Tepe, and Brazillian Cheery have become popular recently as well. Multiple wood types can be finished and stained for a dark hardwood flooring appearance as well. As fas as finishing goes, you will generally have two options. You can opt to have your wood pre-finished before installation, or have unfinished flooring installed, allowing you to finish it as you see fit. Hardwood flooring is appropriate for any room in the home, but is not suitable for kitchens, bathrooms, and basements, as hardwood flooring can expand when subjected to moisture and temperature fluctuations. Not to be confused with natural wood, engineered wood provides a separate wood option that is slightly more versatile in its use, and usually at a cheaper price. The bottom layer is often comprised of solid hardwood, and the top of the panel is made of real hardwood veneer that has been bonded together using heat and compression. 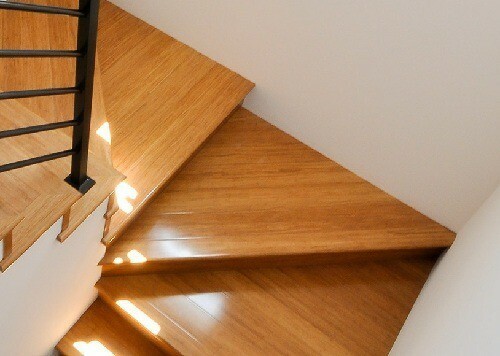 This results in a wood floor that has the look of real hardwood, but using nearly half the amount the hardwood itself. 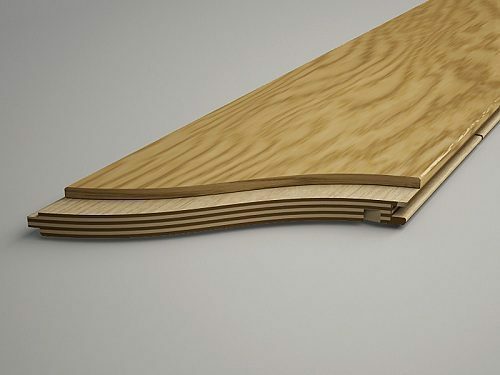 There is also more uniformity with engineered wood flooring, and the flooring’s construction makes it suitable for rooms like basements, where factors such as moisture and temperature would cause normal hardwood flooring to expand. Laminate flooring is a mostly synthetic flooring variety that is made of several layers that have been fused with each other using a laminate process. This is often done using four layers. The bottom layer acts as the backing, allowing it to resist moisture and prevent warping. The next layer is the inner core that is composed of high density fiberboard. The layer on top of that is the image layer, created to look like natural materials using high-definition technology. The final layer on top is the wear layer, which is a transparent material that protects the image layer from scratches and wear over time. Laminate flooring is often used to mimic the look of hardwood flooring, but can be used to imitate stone, metal, marble, and practically anything else. This flooring is a useful way to give your home the look of certain materials, but without the high cost. Laminate flooring can also be used to give the look of wood for rooms you wouldn’t have real wood floors in, such as a basement. It also requires less maintenance, and can be a suitable alternative to natural flooring materials that might not hold up to high traffic areas. Vinyl flooring is another example of synthetic flooring that can be designed to mimic the appearance of natural materials. The top layer features the image or look, while the layer below is comprised of either felt or foam. 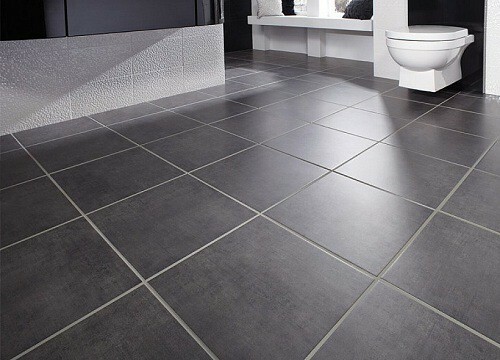 The flooring is available either as panel or tiles, and is very versatile in how it can be used. Due to the composition of the flooring, the surface is much softer, which can make the floor more comfortable to stand on and safer for any children playing. Vinyl flooring comes in a wide variety of colors and textures, and is widely used for high-traffic areas such as office buildings, restaurants, and industrial structures. The vinyl is resistant to moisture and dirt, and is one of the only flooring types that can be installed over existing sub-flooring. Similar to hardwood flooring in many ways, bamboo flooring is made of bamboo that has been harvested, sliced up into long strips with the skin and nodes removed, and boiled to remove any remaining starches or sugars. The processed bamboo is then dried and turned it planes. 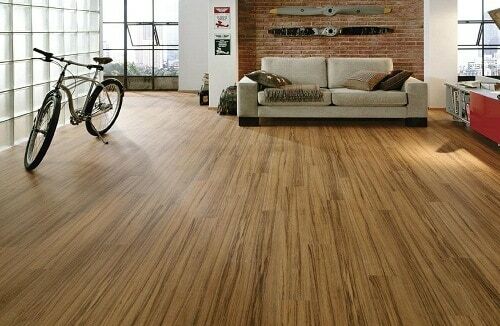 Bamboo flooring can provide a similar look to wood flooring, but with a subtle difference in the overall look. The actual hardness of bamboo flooring can vary, as the darker color planes require additional processing that results in a softer plane. The installation direction of the flooring can have an effect on the texture and features as well. Bamboo flooring offers a unique look, but does require some cautious upkeep. High traffic and household accidents can result in noticeable wear to the look of the flooring. Because of this, bamboo flooring is best for parts of the home with the least amount of traffic. This flooring is also prone to warp with moisture, so homes located in hot and dry climates are better suited for it. Perhaps the most ambiguous and varied flooring type of all, tile flooring essentially means any kind of flooring that can come in tile form. This style of flooring has been used for centuries. Tile flooring can include materials such as stone, marble, metal, clay, ceramic, and even quartz. The most popular and widely used tile flooring materials continues to be ceramic and any kind of natural stone. Ceramic tile can be grouped into two main categories: porcelain and non-porcelain. The most traditional forms of ceramic tile flooring are made from various colors of clay and blended with other minerals. Porcelain ceramic tile also contains a clay base with other minerals, but is mixed in with a natural material called feldspar. This material is melted with the clay and minerals, resulting in a glass-like state that molds everything together, and provides added stability and hardness. The processing of the porcelain tile is what results in the color or texture. After production, the tile has a glaze applied to the surface, available in matte, semi-gloss, and high-gloss. The glaze gives the tile a finished look, and also protects it from wear and tear. Porcelain can be created in endless color and designs, making it incredibly popular due to its unmatched versatility. 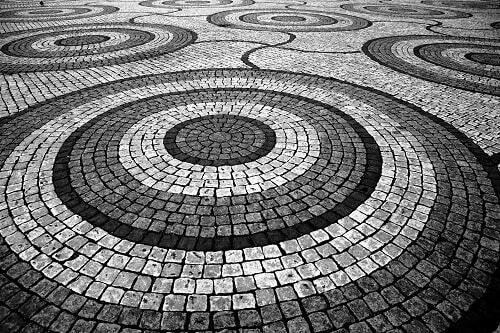 Stone flooring is a natural flooring material that is sourced from a broad range of rocks and stones. The stones are quarried from their source, later being slabbed and finished. After the finishing, they are cut to size and ready for installation. 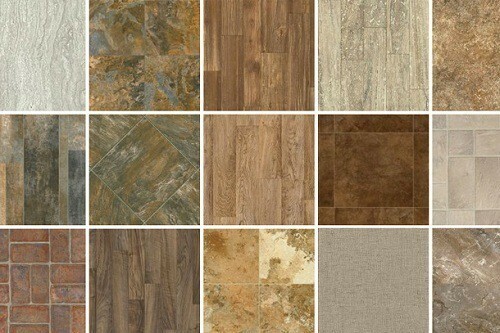 This flooring can come in numerous varieties. Marble – This stone comes in numerous colors, features a distinctive and unique veining throughout, and provides a rich elegance that gives off a very timeless aesthetic. Marble is rather porous, so it is best to be used in areas away from moisture, unless it has extensive sealing that is regularly maintained. Granite – Igneous in its origin, granite flooring is extremely hard and durable, making it suitable for high-traffic areas. It has its own unique speckled appearance that can come in numerous color and texture options. Polished granite is completely resistant to scratching. Slate – is a type of stone flooring belonging to the metamorphic rock High heat and pressure over time has resulted in an earth-toned rock that has a slight, natural texture to it. Some of these rocks look similar to a zoomed-out photo of another planet’s surface, such as Mars. Slate is a popular choice for use in kitchens, and also around pool areas thanks to its natural no-slip surface and waterproof abilities. Limestone – This sedimentary rock has been used for everything from the Pyramids Giza to 19th century buildings in Paris. Limestone is largely composed of skeletal remains of corals molluscs, is very porous, and features an earthy tone that is available in both darker and lighter shades. When used as flooring, the stone can be stained easily, and is less dense than other stone materials. Travertine – This is actually a type of limestone that has been through further natural processing via additional heat and pressure from the earth’s crust.The result is unique crystalized appearance that is just as porous as limestone, with added divots for an even more unique appearance. Travertine has become very popular as kitchen tiling, but it just as suited for floor use, providing an exotic and natural look that stands out. Choosing the best flooring options for your home can be tricky. Numerous factors go into the decision, and the overall cost weighs heavily throughout as well. Here are some tips to guide you along the way. Does your home get heavy traffic? Do you have numerous pets? What about kids? All of these things are important. Homes that see a lot of foot traffic and accidents would be better suited for flooring that is easy to clean and maintain, and resists scratching and stains. Vinyl, some tile flooring, and laminate flooring are among the best choices. Hardwood flooring probably isn’t the best idea for a bathroom. Likewise, you probably won’t be installing bamboo flooring into your basement. Pairing locations of your home with appropriate flooring materials will result in the right ambience, along with ensuring your floor is installed to last. Are you looking to add value to your home? 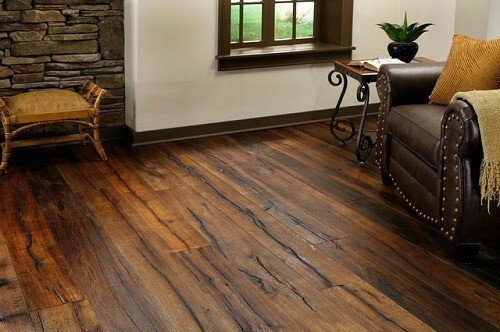 Hardwood flooring would be more effective than synthetic options such as vinyl. Cost is another big factor. Hardwood flooring can be difficult to install on your own, while vinyl and laminate flooring are generally easier, and can be done without hiring contractors. 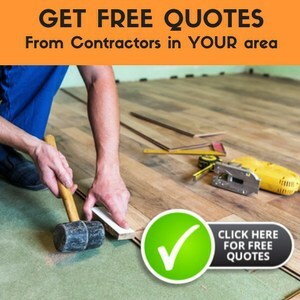 Now that you’ve chosen your flooring, you probably want to know how to install it on your own, or if that’s even possible in the first place. The truth is, flooring installation varies greatly between flooring types. Some are easier than others, while certain flooring types are better suited for professionals. Of course you can always choose to have a professional install regardless, but there are plenty willing to attempt a DIY install. This section will cover DIY methods for all main flooring types. Nearly any installation will require a basic setup of tape measure, trowel, and utility knife. Goggle are always a must-have, and knee pads can help keep you comfortable throughout the process. Power saws such as jigsaws and band saws will be needed to trim pieces as needed. Pneumatic staple guns and nail guns are required for any type of wood flooring install, unless you are floating the floor. In this case, wood glue is needed. 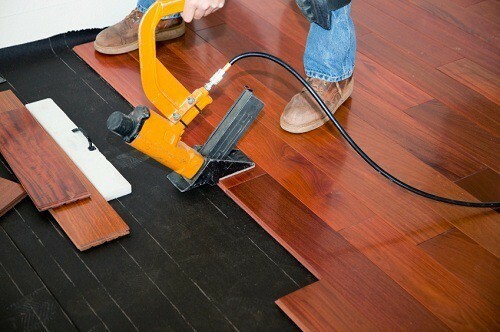 This flooring installation is likely the most intensive, and requires several special tools. Professionals are much more equipped to handle this, as inexperience can result in damage to your sub-floor, as well as wasting of hardwood flooring materials. Saws, trowels, nail guns, mallets, and staple guns are just a few of the required tools needed. 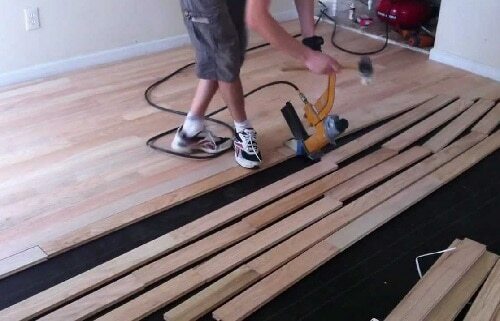 With hardwood flooring, the installation begins on along the longest wall in the room. With the small tongue of the board facing out, each board is laid on the sub-floor with underlayment on top. Spacers are used in between boards during the process, and remove when done. The boards are affixed to the sub-floor and underlayment using a variety of methods, which most often include pneumatic nail guns and staple guns. Trim molding is used on the edges of the wall, with just a touch of space between the boards and wall itself, allowing for expansion during weather changes. Bamboo flooring installation is often very similar to hardwood flooring, although certain types may require some additional steps. Engineered wood flooring installation is easier than hardwood, and is more suited to the novice. There are several methods for this installation, including floating, glue down, nail gun, and staple gun. We’ll stick with the floating method for these instructions. “Floating” refers to flooring that has is not affixed to the floor. This method relies on precise measuring, as the boards are all bonded to each other and not the sub-floor. 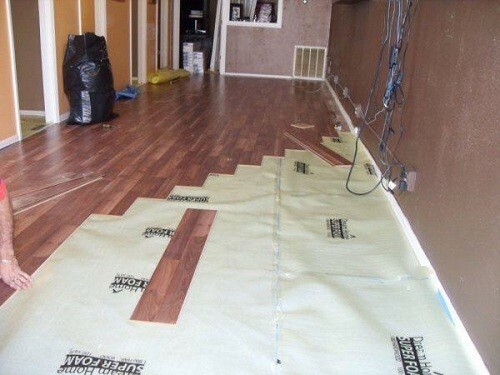 Floating your floor not only makes installation easier, but removal down the road as well. Begin by putting down your underlayment, and gluing down the first board along the longest wall with the tongue facing out. Using your wood glue on the tongue end, piece together each board going from left to right across the room, until all rows are complete. Be sure to use boards from different containers to avoid any blocks of coloring in the floor. Once you’ve reached the wall, apply painters tape securely over the cracks in the board rows to secure them as they dry. Avoid walking on the floor for at least 24 hours to allow for secure and undisturbed bonding. This flooring can be installed as a floating floor as well, and requires tools such as jigsaw and band saws for sizing of the tiles. Laminate flooring often comes with its own underlayment and/or moisture barrier, so follow the manufacturer’s instructions for that part of the install. Each tile is designed to interlock with the other, thus making the installation simply a matter of lining everything up and working your way across the room. Depending on thing such as vents and other obstructions in the floors, additional cutting may be required. Silicone sealant should be used for the wall spacing in kitchens and bathrooms to keep out excess moisture. Heavy objects can be placed on finished portions of the floor for added stability during installation. 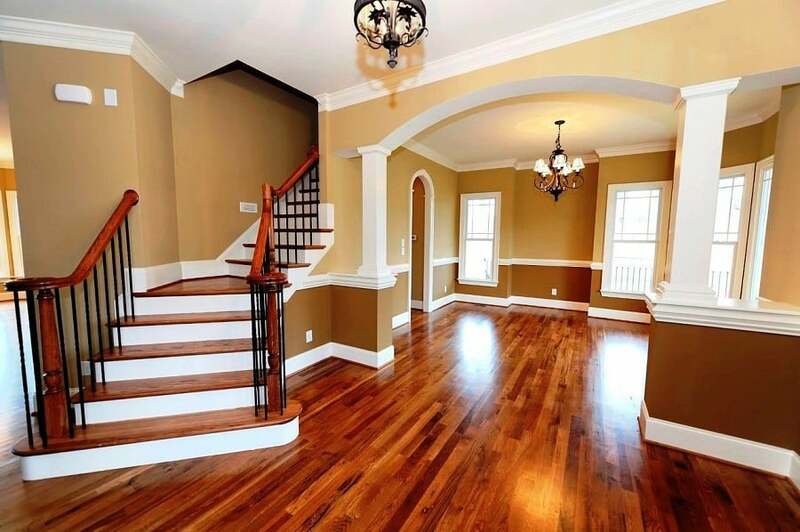 Once flooring is finished, apply or reapply crown moldings and trim to the walls and room transitions. Vinyl flooring is known for being relatively easy to install with just a few basic tools. This flooring can be installed over any type of pre-existing flooring with a smooth surface. Begin by clearing the room of any objects, and remove any nails from the wall where the crown molding was prior to beginning. If you are installing over concrete, be sure that the concrete is swept clean, leaving it completely smooth and dry. If linoleum flooring is present, check for any unevenness, and fix it with embossing leveler. Hardwood, engineered wood, cushioned, and uneven floors will require underlayment. Once you are ready, lay the tiles or segments down in the room as you’d like them installed. Beginning on one side, fold back portions of the floor, and apply your adhesive. Some vinyl flooring may have its own adhesive, requiring you to simply remove the protective sheet and laying the segment down. As you adhere the segments to the sub-floor or underlayment, use a floor roller to press the flooring down and adhere evenly. Allow to sit for 24 hours, and reinstall the crown molding. Move your furniture back in using plywood pieces to avoid damaging the floor. This is a bit different from other flooring installation, as you’ll be using mortar to both hold the tile and fill spaces. Begin by ensuring that your sub-floor is even. Lay your rubber grout float down, and spread the mortar evenly across the float using your trowel. 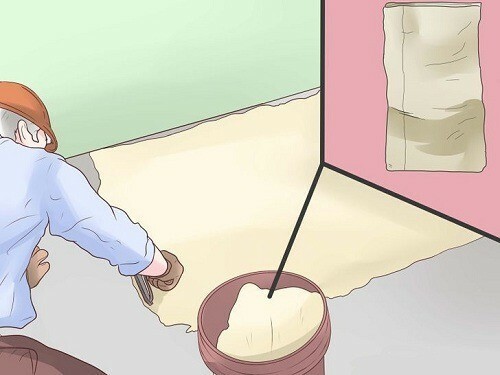 Once your reference lines have been established by cutting lines in the mortar along the grout float, place your first tile down in the middle of the room. Finish a large section, and use a leveler to ensure that the tile is level. If not, use a rubber mallet to lightly level the tiles. After finishing the floor, make more adjustments as needed, and apply a thinset mortar as needed. Remove excess with a damp towel, and allow to dry for at least 24 hours. Keeping your floor neat and clean will not only make your home look its best on a consistent basis, it will ensure longevity of your flooring as well. Each floor type is different, so different cleaning methods must be used for each one. The methods described below are all basic cleaning methods that don’t involve a floor cleaning machine. Wood and Bamboo Floors – Begin by cleaning up debris with either a vacuum or broom. Mop using a wood-safe detergent going with the grain. Buff floor with a cloth and allow to dry. Vinyl Floors – Remove debris with vacuum or broom. Create a solution of apple cider vinegar and hot water (one cup to one gallon water,) and mop entire area, rinsing mop frequently. Laminate Floors – Remove debris with vacuum or broom. Create a solution of distilled vinegar and hot water (two cups to one gallon water,) and mop entire area, rinsing mop frequently. 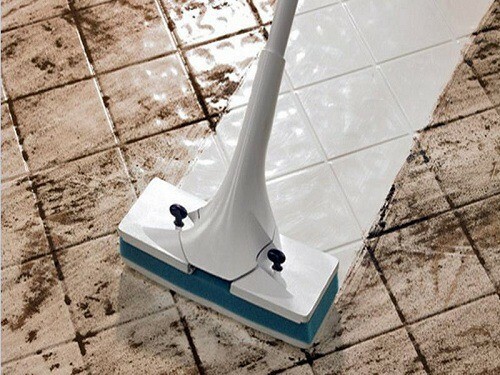 Tile Floors – Remove debris with vacuum or broom. Using a mild detergent and chamois-style mop, work your way back and forth while rinsing mop frequently. Flooring such as wood and vinyl are highly susceptible to damage from moving furniture. To prevent this, use foam padding on chair legs, or transparent floor protectors for items such as rolling office chairs. Floor refinishing can provide a like-new appearance for worn out wood and bamboo floors. To do this, you will need a floor sander and refinishing solution. When floor sanding, be sure to remove the entire finish, leaving the exposed wood completely smooth. 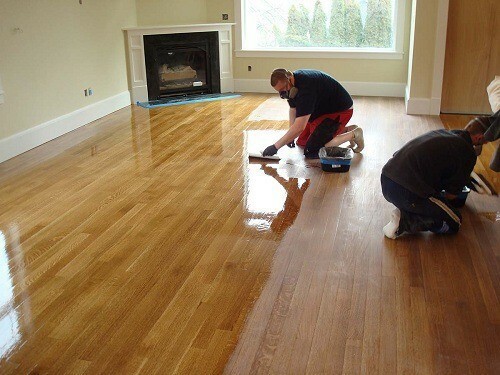 When the floor has been prepped, apply the refinishing solution as instructed by the manufacturer, using plenty of ventilation and a mask as well. Allow to dry for at least 24 hours. Tile and some stone flooring can be restored by using a floor scrubber machine. These scrubbers gently remove built-up stains in the pores of the floors using either water or a very mild cleaning solution. Your floors will look brand new when completed, without spending hours scrubbing by hand.